On Sunday, after being held in prison for almost eight months, the five were convicted of insulting the UAE’s leadership, endangering national security and inciting people to protest. Then a day later, they received a presidential pardon and were freed. One of the five, Ahmed Mansour is a prominent blogger. Another, Nasser bin Gaith, is an economics professor who has lectured at Paris’ Sorbonne university in Abu Dhabi. The two told The Associated Press that they spent days in solitary confinement in Abu Dhabi’s Al Wathba prison. The rest of the time they were held with convicted killers, terrorists, rapists, adulterous, drug dealers and pirates. should release the activists unconditionally and without delay. changes in the Emirates and free elections in which all citizens could participate. shouted slogans condemning the activists. The next hearing is scheduled for July 18. Authorities arrested Mansoor on April 8 and are holding him at the Al Wathba prison in Abu Dhabi. Mansoor has been a vocal proponent of the petition. Before his arrest, he gave numerous television and other media interviews on the issue. Mansoor is a member of Human Rights Watch’s Middle East advisory committee. University, who has criticized UAE authorities for failing to undertake significant political reforms. The three other detained online activists are Fahad Salim Dalk, Hassan Ali al-Khamis, and Ahmed Abd al-Khaleq. In the weeks following the arrests, the UAE expanded its crackdown on civil society by dissolving the elected board of directors of both the Jurist Association and the Teachers’ Association. The decrees, signed by Social Affairs Minister Mariam Mohammed Khalfan Al Roumi, dismissed the boards and replaced their members with state appointees. Both associations, along with two other nongovernmental organizations, had signed a public appeal calling for greater democracy in the country on April 6. The United Nations Declaration on Human Rights Defenders provides that countries should “take all necessary measures to ensure the protection of everyone against any violence, threats, retaliation, adverse discrimination, pressure or any other arbitrary action” as a result of their participation in human rights activity. Two civil society activists and an economist have been detained in the United Arab Emirates (UAE), apparently linked to their calls for political reform. Their lawyer does not know where they are being held. They are likely to be prisoners of conscience. Ahmad Mansoor, a blogger associated with Hewar, an online political forum that is blocked by the UAE authorities, was detained on 8 April by a group of plain-clothed security officials from Amn al-Dawla, the UAE’s security police, together with two uniformed police. They took him from his home which they then searched, removing computers, books and documents. Hours earlier, before dawn, he had received a visit from men who said they were police and wanted to question him about his car, but he refused to accompany them, suspecting that it was a ruse to detain him. Reports suggest that the UAE authorities are attributing his arrest to an alcohol offence, saying bottles of whisky were found in Ahmed Mansoor’s car; however, the real reason for his arrest is believed to be his activism in supporting calls for political and other change in the UAE. 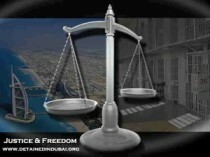 The UAE is a confederation of seven emirates whose ruling families do not permit direct elections or political parties. Fahad Salem al-Shehhi, 38, was arrested at his home in Ajman Emirate at 7 pm on 10 April. He too is associated with the online political forum, Hewar. Nasser bin Ghaith, an economist and lecturer at the Abu Dhabi branch of the Sorbonne University in Paris, was also detained on 10 April in Dubai. He too has written articles online advocating political reform in the UAE. According to three detainees’ lawyer, the authorities said they would produce them at a holding centre in Dubai but then failed to do so. There are fears that they may be held by Amn al-Dawla in Abu Dhabi and that they are at risk of torture or other ill-treatment. Their lawyer expressed particular concern for Ahmed Mansoor, who he said had received death threats and told Amnesty International that he, too, had received death threats via Facebook. Calling on the authorities to remove restrictions on the exercise of the right to freedom of expression, association and assembly, in line with international human rights law and standards. The United Arab Emirates is a federation of seven emirates, each governed by an absolute ruler called an amir. The individual emirates do not hold local elections. Instead, a regionally determined and selected National Electoral Committee elects half the members of a consultative body, the 40-person Federal National Council (FNC), which sits in Abu Dhabi. The other 20 are appointed by the president. The term of office is two years. Amongst its limited remit, the FNC can examine and amend federal legislation but not veto it. On 9 March, over 130 civil and political rights activists in the UAE petitioned the president of the UAE to introduce universal, direct elections for the FNC and to give it legislative powers. Ahmed Mansoor had strongly and openly supported the petition and gave a range of media interviews to support the initiative. On 11 April, a Dubai police official was quoted in Abu Dhabi’s The National newspaper saying that Ahmed Mansoor was detained on the authority of the Federal Prosecutor in connection with a ‘criminal case’. However, no details were provided. Amnesty International believes this to be a pretext to legitimise his arrest. Ahmed Mansoor and Fahad al-Shehhi were reportedly active in Hewar, an online political forum which is banned in the UAE. Nasser bin Ghaith is an economics professor at the Abu Dhabi branch of France’s Sorbonne University. Political suspects in the UAE are commonly held incommunicado in undisclosed locations. Those arrested by Amn al-Dawla are reportedly often kept in solitary confinement. A few political detainees have been allowed to make brief and limited phone calls to their families. Political parties do not exist in the UAE; political dissent is not tolerated and there are severe restrictions on freedom of expression and association. Websites have been targeted for closure and their owners prosecuted for defamation. The use of torture of political detainees has been widely reported. Methods have included sleep deprivation, suspension by the wrists or ankles followed by severe beatings to the soles of the feet and even the use of electric shocks to various parts of the body. The UN Human Rights Committee has commented that routine prolonged solitary confinement is inconsistent with the obligation on states to ensure prisoners are treated with humanity and with respect for their inherent dignity. (General comment 21/44, 6 April 1992).